Now that we’re done with work it’s time for us to start getting ready to head South. 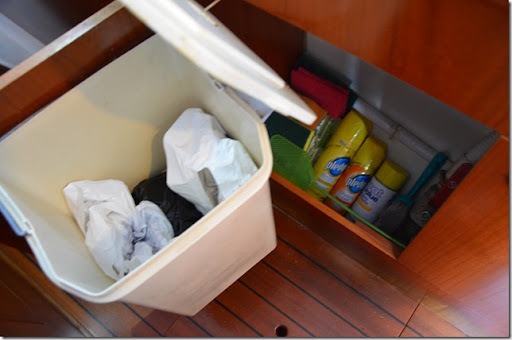 This morning, we loaded the dinghy up with dirty laundry and trash. Jacob was kind enough to let us borrow his car to run errands, so I threw the trash out while Matt went to go pick up the car. 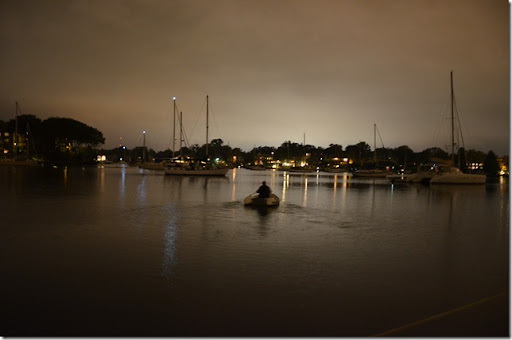 We made stops at the post office, bank, laundromat and grocery store before heading back to the dinghy to reload for a return trip back to the boat. At the laundromat we had wandered into the Mexican market next door. At the back of the market they had a pickup window so we decided to order lunch. Let me tell you, it was some of the best and most authentic Mexican food we’ve had in a long time. It was literally a hole in the wall kind of place but those are the places that we love. Unfortunately I didn’t catch the name of it but if you’re near Annapolis and you go to a laundromat, look for it! Back at the boat, we unloaded everything out of the dinghy and I spent the next couple hours putting everything away and getting the boat prepared for our a.m. departure. 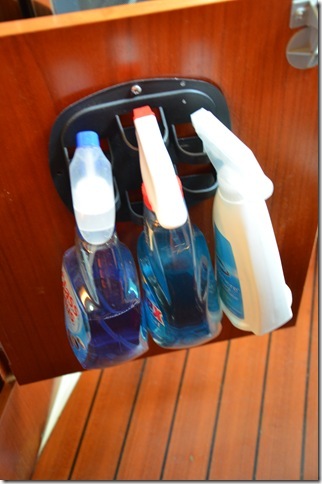 I’m normally a very organized person but since we’ve been working, the boat has become a complete disaster. So after putting all our groceries and laundry away, I spent about 15 minutes cleaning and organizing the cabinets underneath our sink. It may sound weird but I love doing that kind of stuff. My next project will be the cabinets in the kitchen and hopefully I’ll have everything cleaned and re-organized by the time we head out for the Bahamas. Trash Bags, Sponges, Pledge, Fly Swatter and Oven Cleaner all organized. 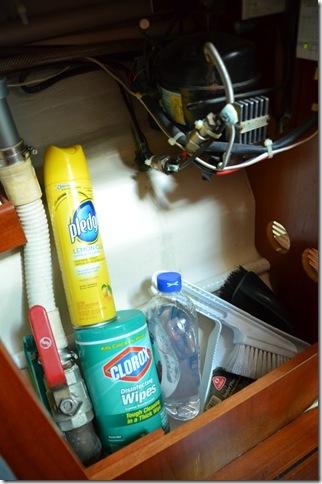 Dust Pan, Clorox Wipes, Pledge and Soap…all necessities for keeping the boat clean. Win, Tom and Jacob came over to the boat for an improv “going away” dinner. We grilled some hamburgers, shared a few last stories and laughs and then they all bid us farewell. We’ve had some great times with these guys over the past few weeks and we’re truly happy to call them friends. We’re sad to leave Annapolis but the weather has turned and it’s time for us to say our goodbyes and head South. Win rowing back to his boat.